I am not sure if we should jump into applying for the BTO now as we are both still repaying our student loans. We have just started working as well. And we have checked and found that we are eligible for the deferred assessment of income schedule that was recently launched in May 2018. I am a believer in well planning in advance. 1) Upon reading your question, actually the first thing that strikes out to me is the relationship. I assume both of you are certain wanting to share your life with each other and not simply because it is the “norm” stage. Pardon me as I am not trying to be offensive but this is important. There are cases of young couples having to folk out a lot penalty $ when they forgo their successful BTO supposing, plus might be ‘blacklisted’ and wait longer next time. 2) Next, at this early stage of career, are you certain both of you like the jobs you are in and can stay for at least 2 years in same company? Oftentimes this is the stage of “finding” yourself in your job and tendency to job hop. The concern here is on your income stability. 3) If you are absolutely certain on items 1 & 2, then I suggest to do a proper financial calculation. List down all the liabilities each of you own like school loan, credit cards. Fixed expenses like food, transport, insurance premiums. Discretionary lifestyle like fine dining, travelling. Total assets if any like CPF OA and any cash savings. It is understandable if you do not have enough cpf and cash for the deposit. However I think BTO using HDB loan is only 5% using CPF which is $20k supposing $400k BTO and you since you will be eligible for deferred scheme I don’t think you need to worry about this deposit. For 2 adults, need only 1 year work to accumulate this $20k in OA. 4) After doing item 3, set out a savings goal like each person save 20% (not sure how much if comfortable) of nett take home pay after paying of your liabilities. You should each open a separate bank account and automate this savings like the SAYE. Also do talk about your lifestyle choices if anything should be cut out like less movies, less travelling etc. This saving goal is not just for your BTO but should be Long term practice due to wedding, home renovation, future kids, emergency back up savings, investments, retirement. Try to increase the rate % as your income increases and debts decreases. If you are able to rationally discuss and take action on the 5 items above, then I think you are ready to apply for BTO. Applying for BTO doesn’t mean you will get it. I know many who applied like 5 times never get it as depends on your luck too. A BTO is definitely a savings in itself since much cheaper than resale especially since you will get lots of grants from government. Awesome sharing! I actually also really believe that with proper planning and commitment, this can be a very strong factor in helping to build the foundation of their relationship and family. Are we sure that at current stage, we're stable and confirm in our r/s leading to marriage ? (This is because many of my friends were not sure / stable and at the point of marriage or before they even go to the discussion of marriage, they are not sure and end up break off before that and lose all the deposit and the chance of 1st priorities to get BTO because of cancellations). (B) list down your study loan repayment schedule (how much to repay per month, how long you need to repay). (C) Use your results in (A), (B) versus your ability to pay @ HDB. (Note that you also need to consider between Bank VS HDB Loan. Typically Bank interest rate is lower but it may raise in times of bad economy(but you can refinance when good times some other bank offer lower interest rate) , while some choose a safer bet of HDB fix loan @ 2.6%. Read this useful guide by Seedly: https://blog.seedly.sg/the-complete-guide-bank-hdb-loan/ to know more). If you are able come out with the 5% Cash as downpayment and sufficient OA in your CPF, both your monthly CPF contributions is sufficient to cover the HDB loan of both(you and hubby/wife) share and your monthly income repayment for the study loan (5/8/10 years) repayment is managable (means with some small amount of cash able about 5 to 10% to save monthly after repaying the study loan for emergency use), then why not go ahead with BTO (which will comes after 2.5 years after successful applications and lead time balloting of possibly 1.5 years, a total of 4 years wait!! ) ? (i) The best is if you both can stay in one of your family house first (some compromises of staying with in-laws) to save $ before BTO comes in 4 years (as this will save you room rentals cost of 4 years $800 +/- x 4 x 12 = 38.4k and you would have settle another 4 years study loan, not to mentioned you can use the 4 years to save for more $ for BTO. (ii) If you don't have a place to stay or have difficult in-laws, then BTO seems to be the sensible choice rather than renting out rooms outside where you need to waste $800 +/1 to rent a HDB room. So instead of paying for others, why not hustle and pay for your own home sweet home now! Such as SHG and AHG. See: https://www.hdb.gov.sg/cs/infoweb/residential/buying-a-flat/new/first-timer-applicants and thus save a lot. (iV) If you plan to have kids in 1 to 2 years time, a house is important for a growth of a kid as you don't have sufficient space and safety for a baby to roam in a rented room be it own family house or BTO wait of 4 years. Basic short answer is no. Let me tackle this from a pure financial perspective - Interest cost of student loan -5%, HDB theoretical returns => 5% rental yield, 1% capital gains, 2% interest cost nets out to be roughly 4%. So if given a choice between paying off your loan or buying a HDB, pay off the loan first. Second thing to consider is this - when you are young, you need flexibility esp in today’s job market where you might find yourself switching careers early . In order to facilitate those decisions, having a stash of cash is always better. Last of all, i get the feeling that you are looking at a BTO from a pure financial perspective. If thats the case, dont do it. The returns from a BTO are not that impressive anyway and certainly not worth rushing to marry for it. Only purchase when u can afford it Or The rice is cooked already. Reason: already in debt is a problem. Being in multiple debts is worst. Tt could lead to break out which forfeit the deposit. Plus there is a one year ban for bto application if the bto is the only choice. If they can commit to the cheapest bto which is lot lesser compare to a mature estates with all grants approved, is still do able. If the grants are used to pay down payment, the couple will owe cpf the grants money and ask to return back. So from student loan debt, it becomes 1. Loss money in deposit 2. Payback to all cpf granted 3. Loss confidenCe in love 4. Become a laughing stock among relatives 5. Have to declare to new rs about the one year ban. Getting married and getting a flat is one thing but once it goes haywire there will be alot of complication that might be long lasting in a or 2 person life. 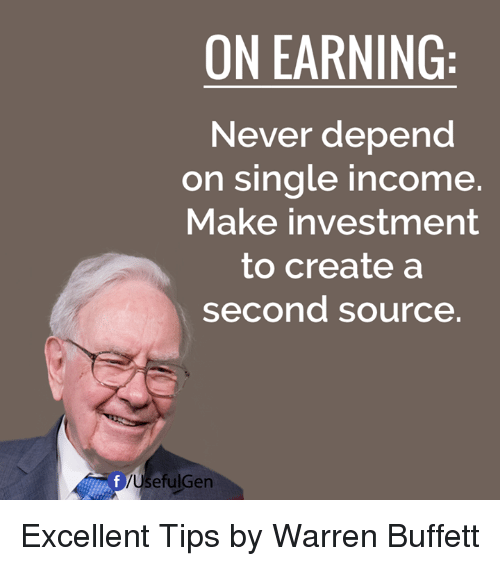 As quoted by Warren Buffett: "Never depend on single income. Make investment to create a second source." It's dangerous to depend solely on single income from your work to pay off your student loan(s), housing loan(s) and other expenses. If one day, the unexpected happens, such as an accident, such that you're unable to work anyone, then you would lose that single income, which would affect your ability to pay off the expenses and then got into heavy debt. Ensure that you have sufficient insurance protection coverage for you and your family. Seek financial advice from a licensed financial advisor on this. Try to choose term plans over whole-life plans to minimise premium and maximise coverage. Educate yourself on how to earn additional income from additional source(s), and find some investment strategy(s) that works for you. Then take action by investing. This way, you wil have additional income sources as backup to pay off your expenses. Hi there, I wouldn't suggest it because having 2 loans at the same time is a very big amount of stress. Inflations aside, job stability is a concern. Usually in the first few years of work people tend to go around trying things out so it's not as stable. If you have to hold on to a job because you have 2 loans to pay, that would be even harder to take as time goes by. Also, it depends if you have any savings right now. I would assume none; and if you apply for the BTO then don't take it, you will soon be marked for it and given a lower priority. $ is always a concern and if your combined salary can meet the minimum downpayment + have some spare for rainy days in CPF/cash, why not? However all these information are not available so I'd assume you are applying for BTO first only because you want to have the flat asap. My suggestion, go to the hdb website and take the questionaire on what's the maximum loan you can take out at HDB with your existing salaries https://services2.hdb.gov.sg/webapp/BP27MaxLoan/BP27PMax1.jsp, and also study this step by step carefully. It will prep you with the costs you are going to deal with if you have a BTO and give you a better idea if you should take on the BTO or not at this point. Planning ahead is good, and I'd say it's recommended due to the nature of public housing here having to wait a few yeas after applying before it's ready for move in. Having said this, do think long and hard about marriage. It's not something easily unravelled once both of you sign on the wedding certificate. If both of you are committed to each other and to sticking to a strict financial plan to pay off your student debts and at the same time saving for renovation expenses, then why not go ahead and apply? It will be a few years before the keys can be collected and this will give you some time to plan for renovation. Yes if you two are serious about marriage and will work together to save money and invest. I see a lot of good answers by the community. Maybe I share another perspective. Instead of looking at finances, look at what future the two of you wish to have. 1) Go for marriage preparation course. That should be the first step ImHO. Credits to Cathie Chew who mentioned it before. Go for a relative long trip or co habit for 1 week. Plenty of surprises awaits you. 3) Then finally, you should start to plan for your finances should the above helped to guide the family goals. With family, then will country prosper. Let me know different thoughts. If you both love each other and know that you will be together for the rest of your lives, the answer is Yes! You have to be realistic on the home price - buying a BTO requires downpayment 10% (if taking a HDB loan) and 20% (if taking a home loan) - this can be between $30,000 to $100,000 depending on your flat budget and type of loan taken. You need to see how much you can gather - cash and CPF-OA when the flat comes. And good thing is this is shared between two people. BTO takes between 2 to 4 years to complete - use this time to build up your funds: CPF-OA - make sure your job pays enough and you also need to set cash aside for renovation. Renovation loan is strongly discouraged. You may also need to consider other aspects of your life - contributions to your own families (e.g. parents' allowance, own bills), wedding expenses and future planning. Exciting times - make up a plan and make it work! I think point 1, you can decide on your own. And for point 2, I think since you have a stable earning, I would highly recommend to consider it now! For point 3, being extremely prudent, as the only fees you would pay would be your downpayment and not the monthly repayment... while you save up before you get your keys! For me personally, we delayed applying until both of us were in reasonably stable jobs with a form of predictable income! And thankfully we were not saddled with Student debt. But that being said, a home is worth planning for, especially if you are keen to settle down before 30-ish? Which I assume you should be also in this age band. Haha Bryan, would be good to give some qualitative ideas and share with our anonymous friend here :) Appreciate that man. We are a friendly and value-adding community. So let's help one another get better.